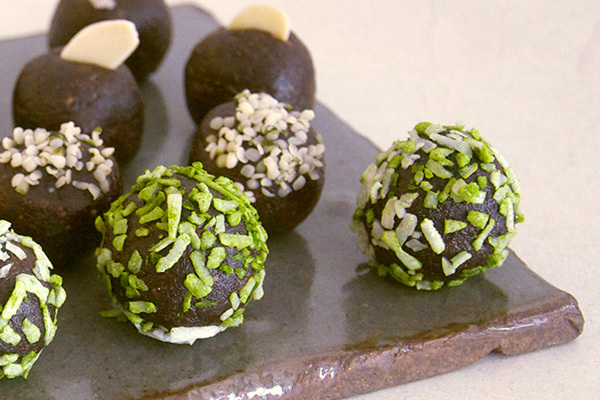 “UN” is for gluten-free, dairy-free, (almost) vegan, chocolatey bonbons. As with all the recipes here on matchasource.com, what follows is more improv, less instruction. Use this bullet list to inspire your own creations. Soak dates in hot water for about 20 minutes. Pit them and puree in a blender. Set aside. Blend almonds until smooth (note: you make use already made almond butter instead). Combine date mixture, almond butter and the rest of the ingredients until the texture is smooth and holds well when pressed. Scoop truffle mixture into bite size balls. Coat with toppings of your choice. Coconut flakes, almond slivers or coco nibs add a contrasting texture. Orange zest adds color and flavor. These should last for at least two weeks in your fridge. Remember to experiment with your own creations. Try other flavors like goji berry, cinnamon, or cayenne. Don’t forget to share it with a friend. drinks and a martini shaker for iced-tea and mocktails.